Lenten envelopes will be located on the table in the Narthex and in the parish hall. ... in the front of the church bears six candles which will be solemnly extinguished, one each week of Lent, leading to Jesus' crucifixion on Good Friday. Five costumed Biblical characters (one each week) will share brief reflections about their encounters with Jesus, then conclude by extinguishing one candle on the wreath. The center candle representing Christ will be extinguished at the Maundy Thursday Tenebrae service held during Holy Week. The Christ candle will be re-lit on Easter morning - The Day of Resurrection. ● Give up grumbling. Constructive criticism is okay--but moaning, groaning, and constant complaining are not Christian virtues. Instead, try to follow the Apostle Paul's admonition to "....in everything give thanks." ● Give up 10-15 minutes in bed. Instead, use that time in prayer, Bible study, and personal devotion. ● Give up looking at other people's flaws. Instead, concentrate on their best points. We all have faults. It's a lot easier to expect people to overlook our shortcomings--when we overlook theirs first. ● Give up speaking unkindly. Instead, let your speech be generous and understanding. It costs so little to say something kind and uplifting. Check that sharp tongue at the door. ● Give up television or computer games one evening a week. Instead, visit some sick or lonely person. There are those who are isolated due to illness or age. Why isolate yourself in front of the "tube" or a computer screen. ● Give up you hatred of anyone or anything. Instead, learn the discipline of love because "....love covers a multitude of sins." ● Give up buying anything but the essentials for yourself. Instead, give the money you would have spent for luxuries to a shelter or food bank. That money could help someone meet their basic needs. We are called to be "stewards" of God's riches--not just consumers. ● Give up worries and anxieties. Instead, entrust them to God. Anxiety is spending emotional energy on something we can do nothing about--like tomorrow. Live today and let God's grace be sufficient. ● Give up judging by appearances and by the standards of the world. Instead, learn to give up yourself to God. There is only one who has the right to judge--Jesus Christ. 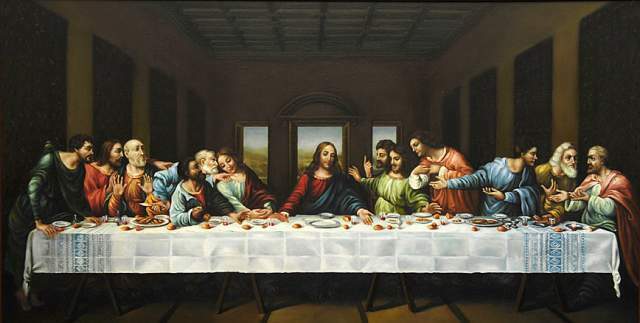 Jesus and his disciples shared the Passover meal the night before he died. Today, that same ceremony adds depth to our Easter celebration. Join us as we celebrate Passover in a new (but very old) way. Tenebrae is a Latin word meaning shadows. The distinctive feature of this liturgy is the gradual extinction of all the lights in the church. This is symbolic of the apparent victory of the powers of darkness over our Lord in his Passion. However, Jesus proved himself to be the Light of the World and conquered the powers of darkness with his victorious Resurrection on Easter morning. A Prayer Vigil will begin at the conclusion of the Service of Tenebrae and will continue through the night, ending at noon the next day (Good Friday). A sign up chart will be located in the parish hall where you may reserve a one hour (or more) block of time. "Could you not keep watch with me one hour?" The Way of the Cross, also known as the Stations of the Cross, is a beautiful service and is an observance of the events of the Passion narrative with time for prayer, meditation and sharing. The Annual Easter Egg Hunt will be held following the 10:00AM service. Everyone will meet in the church.